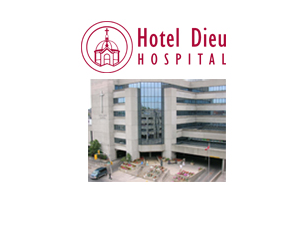 Hotel Dieu Hospital is the ambulatory care teaching and research hospital for Kingston and Southeastern Ontario, affiliated with Queen’s University. As an ambulatory (or outpatient) care facility we provide medical care or treatment that does not require an overnight stay and that includes services such as specialized clinic visits, day surgeries and diagnostic procedures using advanced technology, equipment or procedures. For most of our patients, the length of stay—from time of registration to discharge—occurs on the same day. We provide expert care to more than 500,000 people in the region through specialized programs including pediatrics, medicine, cardiology, surgery, mental health, oncology and urgent care. We deliver quality, safe health care, while advancing innovative research and educating the health care professionals of the future.